For all of you die-hard Soundgarden fans who showed up this week hoping for a detailed exposition on the band's strengths and weaknesses, I have to apologize. Trips and Plans and Events meant that I didn't have a lot of time this week, and I idiotically forgot to stock up on Soundgarden before I left for a road trip last Wednesday. So I completely failed on my Soundgarden homework, and I'm pushing that back to next week. I hope you'll forgive me. However, the road trip did give me (and my exceedingly patient Travel Buddy) a lot of time to listen to music. In lieu of a standard Music Snob write-up, I present to you four condensed reviews of albums that I listened to during the drive. And, as all seasoned drivers know, some music works better on the road than at home (and vice-versa), and I've certainly taken that into effect. Hopefully this will help with planning the soundtrack to your own summer vacations. Enjoy! Context: My Travel Buddy and I had both enjoyed the first Fleet Foxes release that I had checked out and promptly uploaded from the public library. So when I heard that the band's next album was being released a day before our trip, I picked it up (for a remarkably low price). Thoughts: The Fleet Foxes seem to be pretty popular right now, but they don't really make music that's very "cool" (admittedly, I'm not a good judge of this). Instead, their work seems to exist in some sort of dimension outside of time - their spacious songs and immaculate harmonies occupy a weird intersection of folk rock, mountain ballads, psychedelia, and modern indie rock. 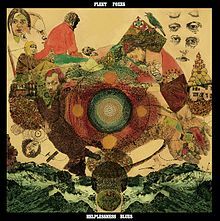 The first Fleet Foxes record was nothing if not chill; listening to the vocal harmonies and beautiful melodies was practically guaranteed to lighten your mood, but it also meant the record just sort of slid off of you, without really leaving a lasting effect. Some of those issues are still there on Helplessness Blues (the band is still in love with the idea of a loud chorus with several members doing backing harmonies), but there's also a little more of a bite. The best songs on the album eschew the pitch-perfect harmonies for the helplessness aesthetic of the title and the crazy breakdown toward the end of the lengthy "The Shrine/An Argument" is especially good. Road-Trip Appropriate? : This album feels like it was meant to be listened to in one go. The band evidently struggled with its production, but whatever they did, it worked, as every harmony, every instrumental choice, sounds like an informedmusical decision, and not just some backing musicians filling in a chord. Listen to this one early in the morning on your trip, before the band's shiny aah-ing and ooh-ing grows grating. Context: My Travel Buddy and I were both familiar with this album, and both of us have copies in our cars. I've written before how Wish You Were Here is my favorite Pink Floyd album. Review: The album is a bona fide classic, and also seems to have a growing reputation as the overlooked sibling that falls between the band-defining Dark Side of the Moon and the bombastic pretensions of The Wall (no one talks about Animals, it seems). While not as iconic of either of those Pink Floyd milestones, Wish You Were Here sums up a lot what's great about the band, and does it with far more restraint than the group usually exercised. The fact that nearly half of the album is an instrumental track might drive some people nuts, but "Shine On You Crazy Diamond" is one of the best instrumental tracks that prog rock ever produced; instead of directionless noodling, the entire suite is structured down to the last detail; every theme molds into another in a way that makes sense, and when the sequence plays out in reverse at the end of the album, you know you're listening to a band who actually has a reason to make a twenty-six minute long track, rather than just vamping for a while and calling it a wrap. And in between those instrumental behemoths are some of Pink Floyd's better ballads ("Wish You Were Here"), blues-rock ("Have a Cigar") and pessimistic moping ("Welcome to the Machine"). Road-Trip Appropriate? : Yes and no. 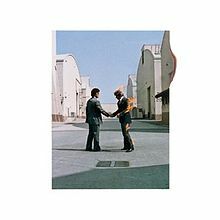 Like Helplessness Blues, Wish You Were Here is clearly an album you want to listen to in one go, and having hours on the open road is the perfect excuse to devote your full attention to the disc. But the production was not meant for the road, and some tracks are so quiet that you'll struggle to hear the softer bits, and drown it out completely with the windows down. Listen to this one in the mid-afternoon, at that point where you've been driving for hours but it still feels like you'll never get there. And turn up your stereo. Context: I really know nothing about Bill Callahan, apart from what I just read on Wikipedia. But I read a review of this album, it sounded interesting, I listened to a few tracks on Grooveshark, and purchased it for cheap before the trip. 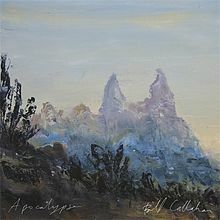 Review: I imagine that Bill Callahan is a love-him-or-hate-him kind of artist. Everything about this album, at least - his throaty voice that often half-sings, the repetitive song structures (without choruses or hooks), the unintrusive, sparse instrumentation - would be divisive. But all these elements worked out in my favor; I enjoyed Apocalypse quite a lot. Mostly it was due to Callahan's excellent voice, dusty but warm. Some of the songs do meander a little bit too much, never really going anywhere, but Callahan's band on this album does enough interesting things to keep you interested. The weakest tracks repeat the same idea ad infinitum, but the stronger ones (like "Drover" or "Riding for the Feeling") spiral around an idea, providing variations on a theme you never quite here. The mid-album "America!" is annoying after a single listen, but aside from that, I found Apocalypse to be a strong album. Road-Trip Appropriate? : Again, the album is quiet and subtle, and perhaps not suited for the noises of the open road (there's also a section where a guitar imitates a siren, which freaked me out everytime I heard it while driving). But this is excellent early evening/twilight music; put it on as the sun goes down and you're reaching your destination, after all the cursory road-trip conversations have drifted off into silence. Context: This was in the car, which belonged to my Travel Buddy. Neither of us had ever listened to it; apparently it had been floating around in the vehicle for years. We figured: why not? Review: The correct answer to the question "Why not?" is that the members of Cypress Hill have voices that are annoying as hell. I had never heard of the band, and so I don't know what I was expecting, but Black Sunday ended up being a strange cross between the nasally rhymes of the Beastie Boys and the weak lyrics of Insane Clown Posse. Nearly every line was predictable, and every chorus was repeated by another member of the group immediately after the previous delivery. ("Insane in the brain!" "Insane in the brain!") This happens on nearly every song. I don't know a whole lot of hip-hop, but the beats on Black Sunday are pretty much the cliched version of what every white person thought hip-hop was circa 1993 - tired drum beats, and incessant klaxons that almost overpower the vocals. The only interesting track was "Hits from the Bong," where I recognized the sample of "Son of a Preacher Man." (The chorus? "Hits from the bong!" (pause) "Hits from the bong, y'all!"). 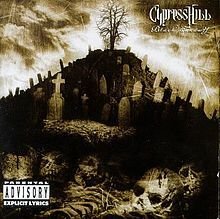 But for the most part, Cypress Hill was repetitive, predictable, annoying, and incredibly dated. We didn't finish the CD. Road-Trip Appropriate? 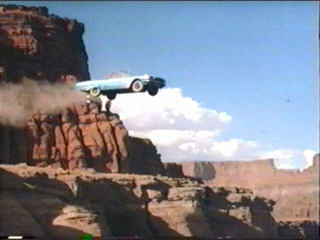 : This might be a suitable soundtrack for a Thelma and Louise style cliff jump. Otherwise, no.